Renovating your home is an exciting step towards truly making it yours. Whether you’ve bought a bargain fixer-upper and want to transform it into your dream home or you simply wish to renovate a few rooms, going over designs, styles and new layouts is always a lot of fun. However, undertaking your first renovation project is no small task, and if you’re not careful, there’s a chance you might not end up with what you had in mind. 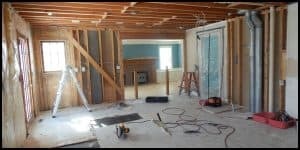 Fortunately, help is at hand, so read on to see how to plan your first home renovation project perfectly. Wise men say that only fools rush in, and they speak the truth! Take time to plan your renovation, especially if you’ve only just moved into your new home. You need to get an idea about how space flows at the moment before deciding how you can redesign it to work better. By spending at least 4 months in your new home before going ahead with a renovation, you’ll be in a far better place to decide how your space can best work for you. Of course, if you’ve bought a fixer-upper, it might not be in any state for waiting. Even so, it’s best to work out how you will renovate it, and whether it’s viable, before rushing in and grabbing a bargain. Though you’re taking your time before going ahead with a renovation, that’s not to say you need to sit idle. Start planning exactly what you want to do to your home and get the bare bones of a plan on paper. This plan may change over time, but it’s good to have a rough idea. Figure out whether you want to renovate the entire home or just a few rooms. Maybe renovating your bathroom or giving your bedroom a makeover will be enough to breathe new life into the entire home. Once you have the bones of a plan down on paper and an idea of what you want to change, you can start fleshing it out a little more. Think about what materials you want to use, which styles and designs you like, and what colour schemes would work best. You don’t need to create a complete blueprint, but this information will be very useful when you start to speak with contractors. Once you know what you want, start researching local contractors. Take time to research as many as you can, taking recommendations from friends and family into account. Create a shortlist of around three to five contenders and arrange to meet with all of them. When you meet, discuss your plans and get feedback from each one. A good contractor will generally offer advice, constructive criticism where needed, and alternative ideas that might save you money. Ask as many questions as you can think of and be sure to get an estimate. Meeting with several contractors allows you to get feedback from a number of professionals, as well as getting an idea of which you feel you’d be happiest working with. When you do come to choosing one, don’t just go for the cheapest, but think about which you’d be comfortable having in your home. With a contractor in mind and an estimate to go on, you can start to create an accurate budget, and see just how feasible the whole project is. Be sure to take into account additional expenses such as eating out, accommodation, etc., and always add at least 15% to cover unexpected costs. It’s good practice to consider the return on investment (ROI), even if you don’t plan on selling any time soon. Make sure you’re not going to end up pricing your home out of the neighbourhood and think about whether it’s worth going all out on a luxury remodel. It’s not too late to alter your plans and to go for a more mid-range renovation if you think it might be the best thing for your budget and ROI. Using your budget, ROI and suggestions from your contractor, tweak your plans until they’re feasible—and until you’re happy. Meet with your contractor to discuss the revised plan and finalize the small details. Finally, fix a date for the work to commence, being sure that you know how long it’ll take. You may choose to do everything at once or stagger the work room by room. The choice is yours and mostly depends on your budget, schedule and the urgency of the work in question. If you do need to stagger, target the rooms you use most first, favouring kitchens and bathrooms over bedrooms.